How to get there: This trip was day two after skiing to Kvannefjellet the previous day. I had parked at Hovden, this trip can be done as a very long day trip from there, but there are closer locations that could be considered. 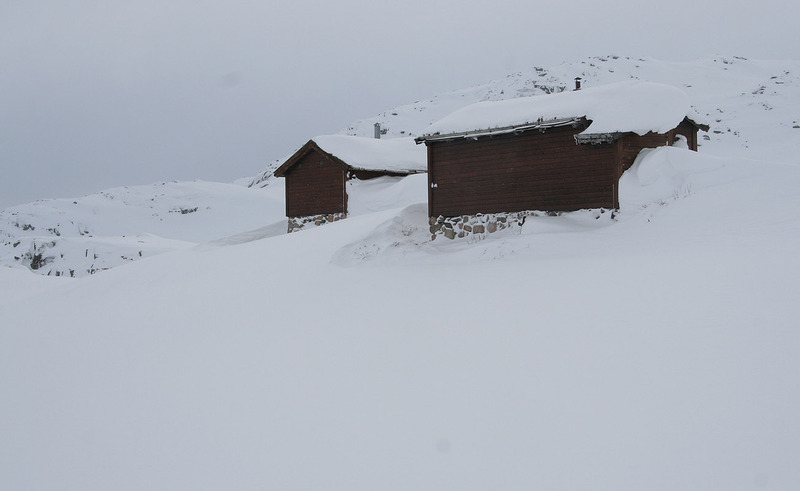 Route description: This route description starts at the DNT self serve hut Tjørnbrotbu, located at 1300 meter. First, head south across lake 1279, then down into the distinct valley east of Auversvasseggi. Follow this valley slightly east of south to lake Nedre Viervadet and further onwards to Nordre Gjuvvatn at 1161 meter. Stay left and aim for a very distinct, but narrow passage that continues in the same general direction connecting to lake Midtre Gjuvvatn at 1127 meter. At its very eastern end, a small, distinct valley continues east, climbing to lake 1235. Make certain that you ascend here, do not proceed to lake Ytre Gjuvvatn. The slope on the north-east side of lake 1235 has cornices, but one can ascend this slightly steeper slope (a very short pitch) just about half way along the lake. As you reach more level terrain, head right (south-east) and climb the slope on the east side of lake 1268. From here, one can aim more or less directly towards the summit. There are two summits, the higher one is located behind. 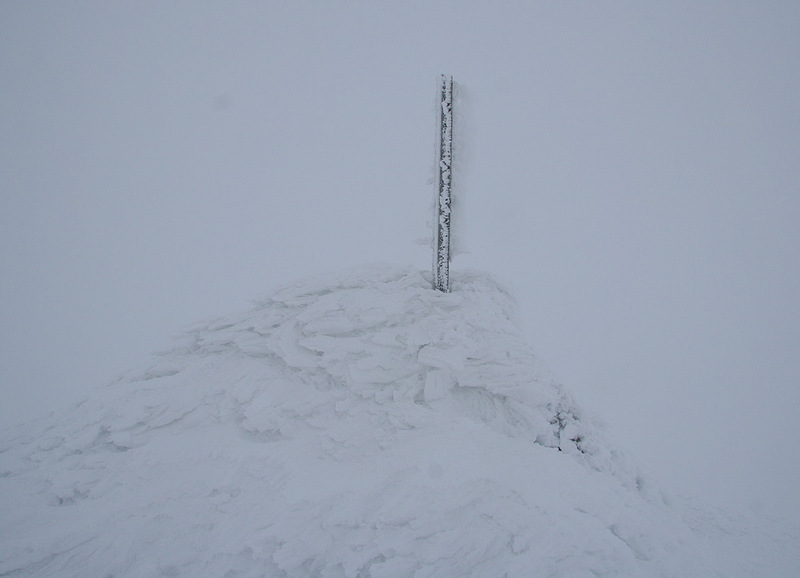 Turn the first summit on its west side, then proceed to the small cairn that marks the proper summit. 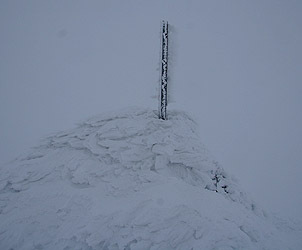 This summit is the highest point in Øst-Agder fylke. Return the same way, if going back to Hovden, then continue north-west to lake Auversvatn at 1144 meter. 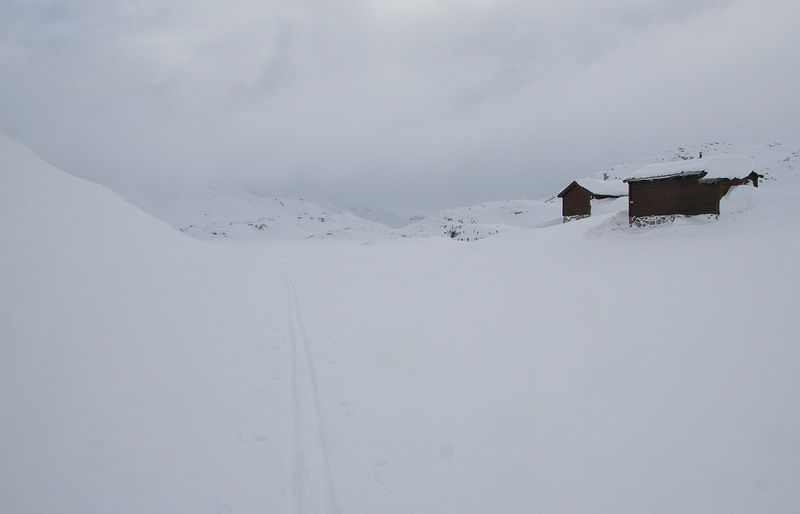 The groomed track to Hovden runs close to a building that is located at the north-west end of this lake. From here to Hovden is a very easy downhill sloping track, the distance is roughly 10 kilometer. I got up at 0600 and prepared pancakes for breakfast while heating water in order to do the dishes and generally make the hut clean and tidy. I made some more firewood including tiny pieces for starting a new fire, packed my belongings and by 0800, I was ready to start out. As I would not return here, my backpack with extra gear as well as a sleeping bag etc. would have to be carried on this trip. I was slightly worried that my progress would be slow due to trail breaking in deep snow. I made up my mind that I should consider turning around by 12 noon. I had a long drive back to Bergen and wanted an evening meal with my wife. Fortunately, the snow was largely better than expected. A few stretches with deep snow, but also firmer snow where the track was only a ski boot deep. The weather was completely overcast and the light was not good. Visibility was fine below 1200 meter, while everything higher disappeared into the clouds. I made good progress and before long I took the ascending valley towards lake 1235. Here, I went into the fog and with close to zero visibility, I made my ascent slowly and carefully in order not to run into anything steep. In fact, the short pitch above lake 1235 had cornices on either side and it was clear that the descent would have to be exactly back down the same way, no more left or right. Suddenly, I ran into the first summit, it looked big and steep as things almost always do in the fog. Contouring around, I soon climbed the final slope and got sight of the cairn about 4 meters away. Arrival at 1100, 3 hours from the start, I was quite happy with my overall progress. A picture of the cairn, no more reason to stay around. As a slight wind was moving snow around, I wanted to descend back down before my tracks would disappear. It is easier than using the GPS to backtrack the same route. Back down at lake 1235, I regained visibility and celebrated a successful summit with a bar of chocolate. The return ski was nice, my track was perfectly fine and I skied pretty non stop back to lake Auversvatn. From here, I merged with the groomed track and had an easy ski for the last 10K. Back at the car by 1400, 6 hours and 36 kilometer with a pretty full backpack carried all the way. 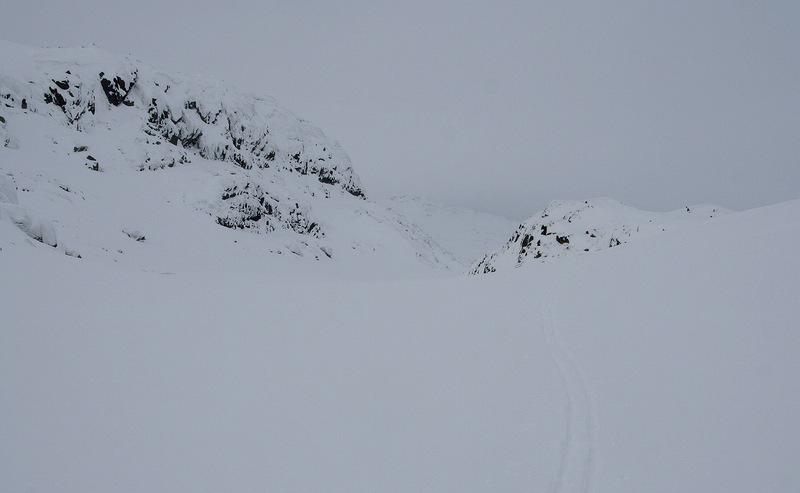 The trip was a very nice experience navigating in new terrain without any signs of other skiers. The weather was not great, but the overall conditions were good. I was pleased with a new summit and a pretty long ski trip with a decent average speed. My drive back to Bergen was uneventful except that I missed the ferry at Utne by 5 minutes and subsequently was blocked from exiting the next ferry despite driving on board as number one. Quite unreasonable ferry crew that left me at the very end of a long line of cars from Kvanndal and all the way back to Bergen where I arrived at 2000. The route going NW from Midtre Gjuvvatna. The hut by Midtre Gjuvvatna. The route going SE from the hut at Midtre Gjuvvatna.